Time for tea? Or did I mean time for chocolate? In this household it’s both. We drink a lot of tea of varying sorts and we drink quite a bit of chocolate too. Our chocolate usually comes in the form of a teaspoon of cocoa in a mug of hot water. Occasionally we add a splash of milk. Sometimes though it’s fun to splash out and have what most people think of as hot chocolate – chocolate made with milk. Enthusiastic as we are for these drinks, I was delighted to be sent some drinking chocolate, some chocolate tea and a whisk to review. 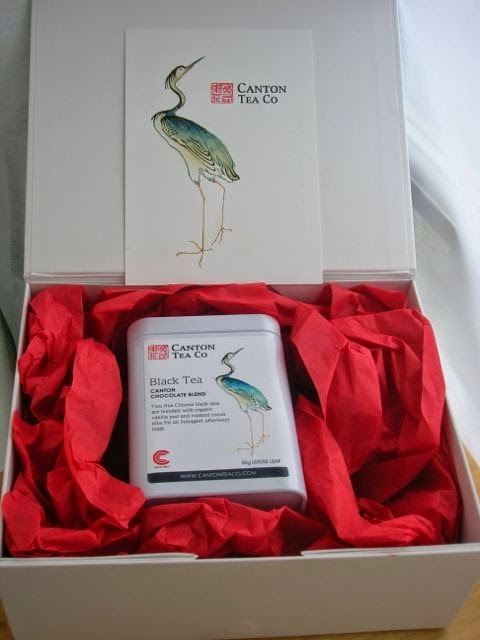 This tea came in a very elegant white tin from the Canton Tea Company and was well packed in a sturdy white box. I really liked the signature crane which I found to be particularly apt as well as attractive. The tea is a loose leaved black tea with added cocoa nibs and vanilla pod and weighs in at 50g. It is actually a blend of two fine Chinese black teas: Bai Lin Gong Fu and Yunnan Black. I’m not normally a fan of black tea, preferring green, white or rooibos, but I was keen to try this one due to the cocoa content. Gosh and golly, I was in for a real treat. On opening the tin a strong aroma of chocolate wafted out. This was followed by a fruity note and then finally the tea came through. Neither CT or I like our tea particularly strong, so I brewed a pot of tea for two with one heaped teaspoon, rather than the recommended two to three flat teaspoons per mug. I steeped it for the stated two minutes with water that was just off the boil. This gave us a perfect cup of tea which was full of flavour, well rounded and really quite moreish. It wasn’t in the least bit bitter and tasted simultaneously of chocolate, tea and plum. When I later read the tasting notes on the tin I was surprised to see that plum was one of the flavours mentioned, along with cocoa of course. We both failed, however, to notice the caramel sweetness that was also described. One of the benefits of using good quality tea leaves is that you can use them again and sometimes again and again and still enjoy a really good cup of tea. We had two good brews out of our one heaped teaspoon, so I suspect more would be achieved if the full amount was used. For a black tea I would give this one ten out of ten. A 50g bag costs £7.50 and is available from the Canton Tea Co. online shop. If you’re going to have a “proper” hot chocolate, you may as well go the whole hog and have one made with pieces of real chocolate. It wasn’t until I received two different brands of drinking chocolate to review at the same time, however, that I realised that different hot chocolates lend themselves to different ways of preparation and serving. As soon as CT saw the name Hans Sloane, he approved. Not only was he a fellow botanist, but CT spent some months mowing the lawns in the London square that bears Sloane’s name. In fact, Hans Sloane was a 17th century chocolate pioneer, discovering it when he lived in Jamaica where the locals drank it with water and eggs. It was he that tried mixing it with milk so that it became the drink we know and love so well today. I was sent two two 270g packets of chocolate beads and indeed the variably sized, shiny pieces had a bead like quality. I was really excited to read on the packets that either milk or water could be used. I’ve been meaning to try making hot chocolate with water for a very long time, but somehow never seem to get around to it. This gave me the prompt I needed. Rich Dark (53%) – this was indeed rich and dark, also thick and unctuous with a creamy mouthfeel. Even made with only water it tastes like an indulgence. Mind you it is suggested that three tablespoons are used per 200ml of liquid. When I weighed this, it came to a whopping 60g – no wonder it was rich. I was truly wowed by this chocolate and reckon that water is the way to go. Natural Honey (32%) – milk chocolate blended with honey, there was no doubting the flavour. Having had such success using the water with the Rich Dark beads, I decided to try it with the Natural Honey beads too. Again, this was rich, flavoursome and very sweet and it needed no other accompaniment. Yes it’s sweet, but then that’s what you expect of honey and it is, nevertheless delicious. As a beekeeper, CT’s approval just kept rising. The chocolate comes in four other flavours which I’d be very willing to try: Smooth Milk, Grenada 60%, Madagascar 67% and Ecuador 70%. The packs are available in Waitrose and Tesco with a RRP of £4.99. These dark chocolate flakes were quite different and came in a 350g tub. The cocoa content was slightly higher than the Hans Sloane, being 55% and on opening a rich chocolate aroma rose up to fill my senses in a most delightful way. The directions here were for three heaped teaspoons per 200ml of milk, which was considerably less than the aforementioned brand and only weighed 25g. This of course means the chocolate goes a lot further, but won’t be as rich. This being the case, I thought it lent itself to being made the traditional way, with milk; indeed, this was the only direction given. It made for a very nice cup of milky hot chocolate. The tub stated that you could have a magical hot chocolate experience by topping with whipped cream, marshmallows and a generous sprinkling of chocolate flakes. I tried that out too – it would have been churlish not to. I used some of the Brown Bear flakes to sprinkle over the top which saved a bit of time and a lot of mess not having to flake the chocolate myself. Unsurprisingly, this worked very well. It was completely over the top, but so worth it. For comparison, we also tried making this with hot water. Although pleasant, we found it a bit thin. To be fair, the quantities given in the directions varied between the two brands. This one used a lot less chocolate so the comparison was not exactly fair. Recently launched, just in time for Easter, this is available £6.99 from the Brown Bear online shop. As I had been sent a manual hand held whisk to review from G3 Direct, I thought it would be good to try it out with my hot chocolate drinks. The Nova whisk is a little unusual in that you push down on the handle repeatedly to turn the head. This requires less effort than a balloon whisk and is meant to be helpful for those with wrist mobility problems or carpal tunnel syndrome. If you’d like to see it in action, head to the video provided by G3 Direct. The handle comes in various shades, but sadly not red. I opted for a vibrant green instead, although I was also quite tempted by the orange. I whisked the hot chocolates rather than stirring them and also used it to whip up the cream. I have to say, since I first used it, I’ve abandoned all other whisks when it comes to whipping up double cream. It’s a dream to use requiring little effort and making less mess than a balloon or electric whisk. Funnily enough, I saw a demo at the Big Cake Show where the whisk was used to froth semi-skimmed milk – in a matter of seconds it seemed. I don’t drink semi-skimmed, so tried this on some whole milk. It did froth up, but collapsed almost immediately, so my dreams of adding an attractive frothy top to my drinks didn’t last very long. With thanks to the Canton Tea Co, Story Pr, Brown Bear and G3 Direct for the above mentioned products. I was not required to write a positive review and as always all opinions are my own. Chocolate tea? wow..live and learn..didn’t know it exists at all. How weird is that, I was only wondering yesterday whether you could get chocolate tea?! And there you have it….. I too have a Nova whisk (purple) which I got a couple of years ago from a little stall selling them in Weymouth during the Olympics. I LOVE it and it is constantly in use…… perfect for batters and mixing liquids and eggs together when baking. It’s not great for things like cream as it takes too long, but it’s incredibly useful! I’ve tried “chocolate tea” a few times now and I adore it! I’ve been making some really delicious tea using my cocoa shells and it has a very unusual flavour. Hoping to write a post about cocoa shell tea soon if I can take some decent photos! Sir Hans Sloane is right near me and I’ve been lucky enough to visit twice (with work)! Really great little company. SO enjoyed this. Totally up my street as a tea addict and chocoholic. Need to keep away from the hot choc myself but my kids love it of course. I adore loose leaf tea. Have a great Parisian variety in my cupboard which is sadly coming to an end. Luckily a few tins of exotic looking types still awaiting opening since xmas presents were received. Oooo those hot chocolates look great! You can’t beat a super indulgent hot chocolate with real chocolate pieces! Chocolate tea? Interesting , I have a similar whisk and I love it too its great and takes minimal effort to whisk up batter, pancake mixes and cream. I have never heard of chocolate tea – that would be a totally new experience! I have one of those whisks and they really do work well! Chocolate tea? I’ve never heard of it before, but would love to try 😉 I love real hot chocolates! I would say a big yes please to all of those esp the chocolate tea. I have never heard of chocolate tea before. Such a pretty little canister too.